A solid light indicates connection on the Internet port. A solid light indicates that the wireless segment is ready. This LED blinks during the WPS connection process. Once connected the LED will turn off. Press this button to configure your wireless clients using WPS. Refer to the next panel for more information. A solid light indicates a proper connection to the power supply. Windows users can use the Quick Router Setup Wizard (from the CD) to configuretheir router. If you do not want to use the wizard, lost your CD, or are running Mac or Linux, you will need to use the manual setup procedure. For the Wizard to work, the computer must be connected to the Internet and be online. If you have disconnected any hardware, please re-connect your computer back into the modem and make sure you are online.Insert the CD into your drive on a computer that is online and click Install to start the Quick Router Setup Wizard. 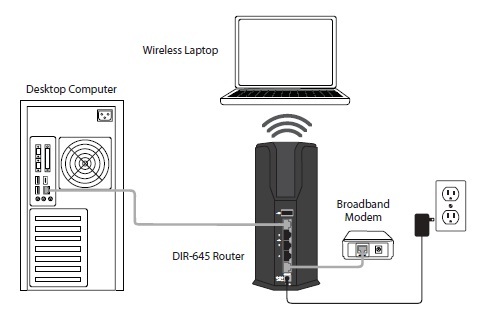 Follow the on-screen instructions to install and configure your D-Link DIR-645 router. Step 1 – Once you configure your router, you can connect your WPS-enabled clients to the router and it will automatically configure your client. Push the button on DIR-645 to initiate a secured wireless connection. Step 2 – Within 120 seconds, push the WPS button on your wireless clients to link them together. During this process the WPS LED on the router will blink. Step 3 – Once the WPS LED stops blinking, your wireless clients will be connected to the router and automatically configured. Position your D-Link DIR-645 router close to your modem and the computer that is already online. Place this router in an open area of your intended work area for better wireless coverage. Unplug the Ethernet cable from your modem that is connected to your computer. Plug it into the blue port labeled 1 on the back of your router. The D-Link DIR-645 router is now connected to your computer. the user manual for more detailed installation information and advanced features. I am interested in buying the DIR-645. I have a Mac G5 computer. It does not have the Intel CPU. Can I configure the DIR-645 with the Safari Browser, currently version 5.0.6?